August Americana | August 12-13 | Skinner Inc. 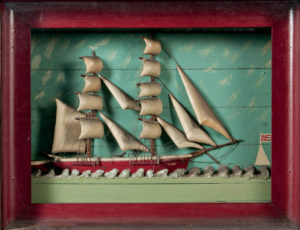 The Arthur and Sybil Kern Collection of American Folk Art is encyclopedic in its representation of New England folk art. 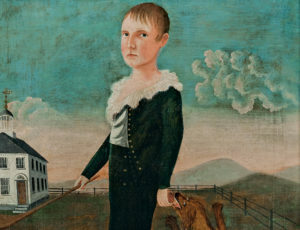 Featuring numerous works by Jane A. Davis, James Sanford Ellsworth, Ruth Whittier and Dr. Samuel A. Shute, Rufus Hathaway, and Erastus Salisbury Field, to name just a few, the collection offers the connoisseur an unparalleled opportunity to acquire seldom-seen works. 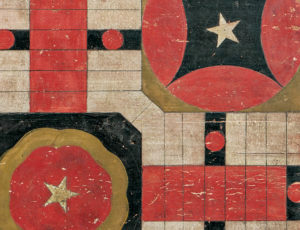 Consisting of over 420 lots featuring The Americana collection of Robert Cooney, selections from the Ronnie Newman Textile Collection, rare pieces from the Jonathan Rickard Collection of Mocha and Related Dipped Wares and an impressive selection of early American furniture, folk art, and decorative arts. This entry was posted in Blog and tagged american antiques, American antiques auctions, American art, american folk art, American furniture, american textiles, Americana, americana auction, antique textiles, country furniture, Ellsworth, folk art, painted antique furniture, Samuel Shute by Skinner. Bookmark the permalink.